With support for 8×8 MIMO (multiple input multiple output) and OFDMA (orthogonal frequency division multiple access), Wi-Fi 6 personal testbeds require more integration than legacy testbeds to keep their cost, size and weight practical and affordable. 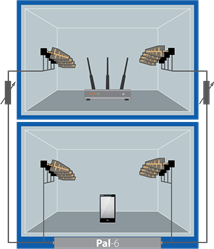 Littleton, Massachusetts, January 27th, 2019 – octoScope®, the leader in accurate, repeatable and automated wireless personal testbeds, today announced the new Wi-Fi 6 (11ax) capable smartBox™ chamber with built-in test instrumentation for testing wireless devices and systems. Prior to the smartBox, all the octoBox® instruments, including the Pal partner devices, had to be mounted outside the octoBox chambers, requiring extra cost and complexity to shield the instruments from interference and couple them into the chambers. With support for 8×8 MIMO (multiple input multiple output) and OFDMA (orthogonal frequency division multiple access), Wi-Fi 6 personal testbeds require more integration than legacy testbeds to keep their cost, size and weight practical and affordable. In addition to reducing cost, the smartBox enables distributed monitoring and analysis and lets you easily interchange real devices and the Pal instruments for use as traffic partners. With the built-in Pal-6 instrument and 8×8 MIMO-OTA support, the smartBox enables an integrated dual-band sniffer or traffic generator local to each device in the testbed. The smartBox architecture greatly simplifies complex testbeds configured for testing Wi-Fi 6, OFDMA, mesh, roaming, Wi-Fi/BT coexistence, DFS (dynamic frequency selection) and other system level tests.